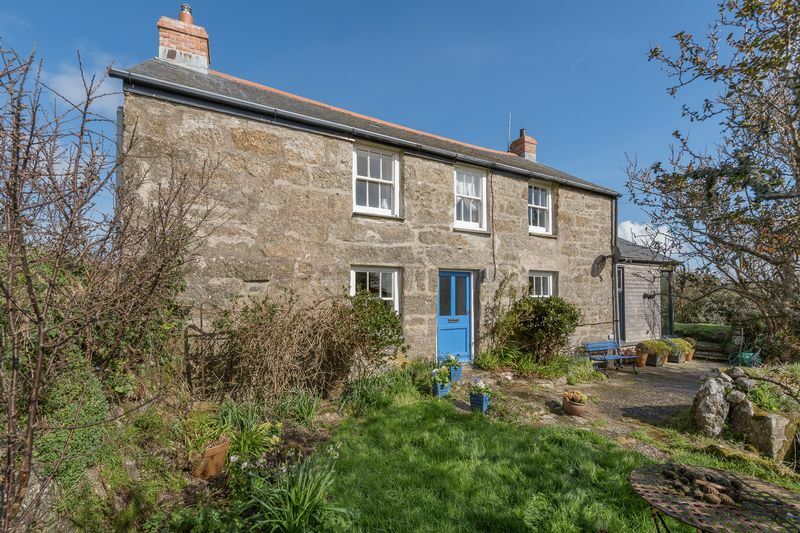 Internally this period granite cottage has a wealth of charm and character with beamed ceilings, an oil fired ‘Aga’ and slate floors to the majority of the ground floor rooms. A particular feature is the stunning living room which has a double height ceiling with exposed beams, there are large glass panels giving lots of light and sliding doors open on to a formal terrace. There is a spacious family size kitchen with contemporary units and appliances including solid oak worktops and a useful central work island/breakfast bar unit, French windows lead out to the beautiful Mediterranean style barbecue/dining terrace and garden. A well designed utility, finished to a high standard, complements the kitchen and there is also a ground floor shower room with American style power shower. The front door opens into a dining/family room with cream ‘Aga’ and an adjoining cosy snug/study which features a wood burning stove. 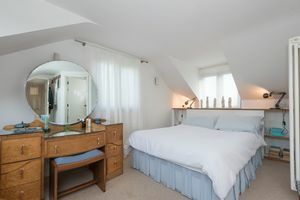 On the first floor the master bedroom enjoys far reaching views and a handcrafted contemporary en-suite bathroom. 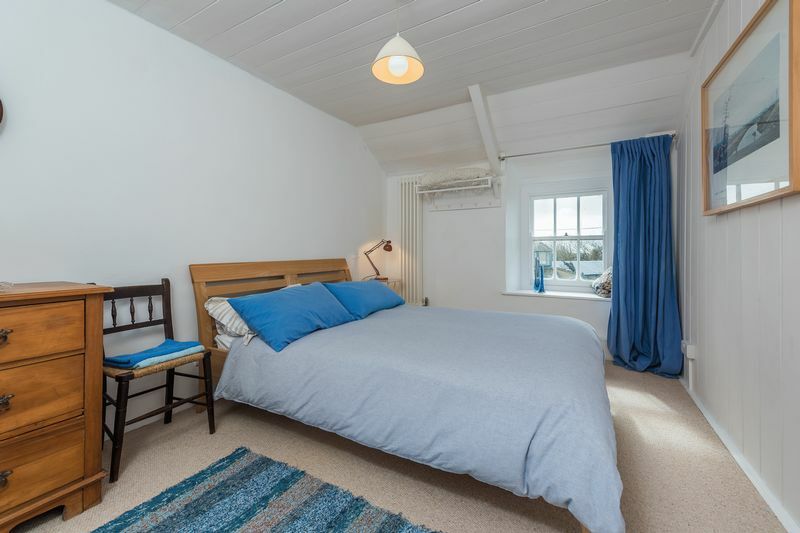 There are two further good sized bedrooms and a spacious contemporary style bathroom. To the outside the wonderful gardens are laid out with granite hedging, lawns and terraces and afford a high degree of privacy. An unusual outbuilding with lookout and a useful 30ft studio/workshop are two more interesting features to be found within the surrounding garden. 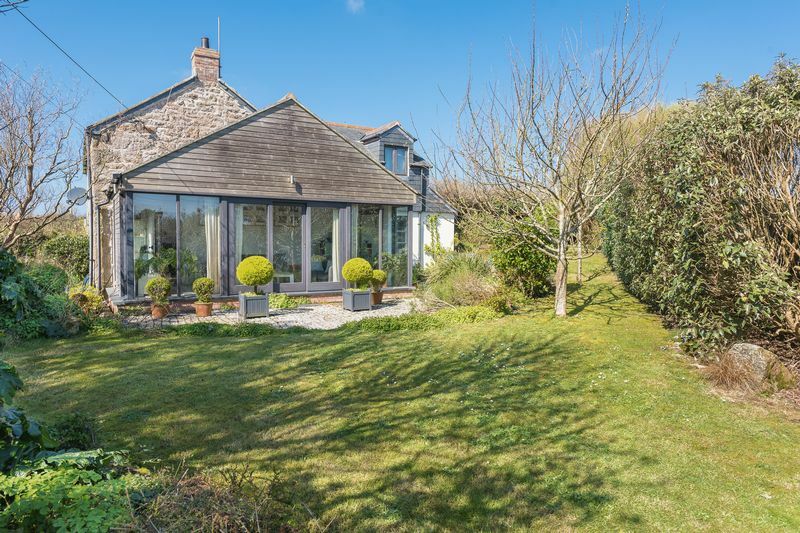 Located in a lovely rural spot away from the main roads, but also conveniently located to access the A30. Crows An Wra is only three miles from Sennen Cove with its lovely beaches and coastlines walks. 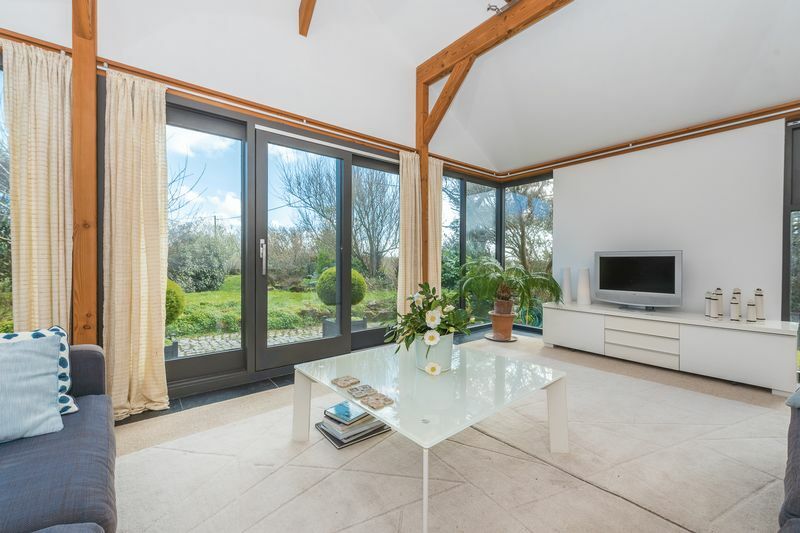 The hamlet is surrounded by a designated area of outstanding natural beauty and there are many countryside walks to enjoy nearby. 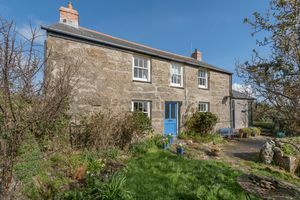 The nearby village of St Buryan is two miles distant and benefits from a convenience shop and Post Office, Public House, Primary School and a community centre. 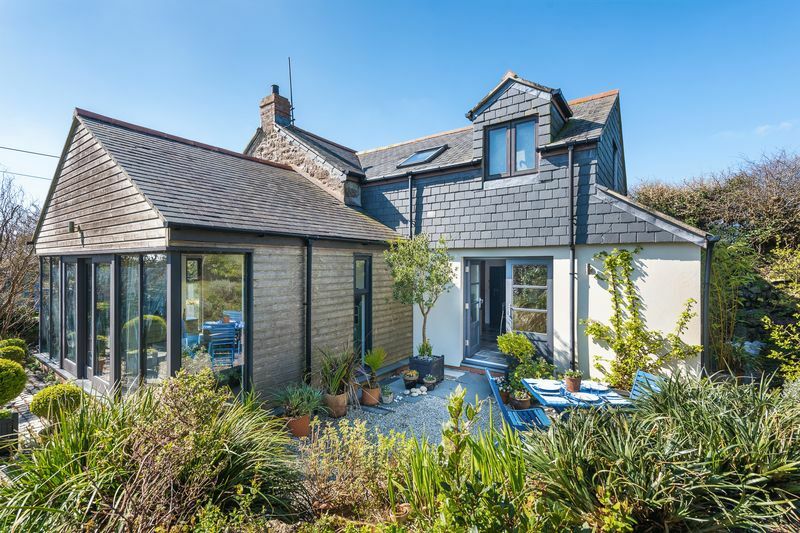 The larger market town of Penzance is six miles away and here you will find a wide range of retail outlets and a main line train station. 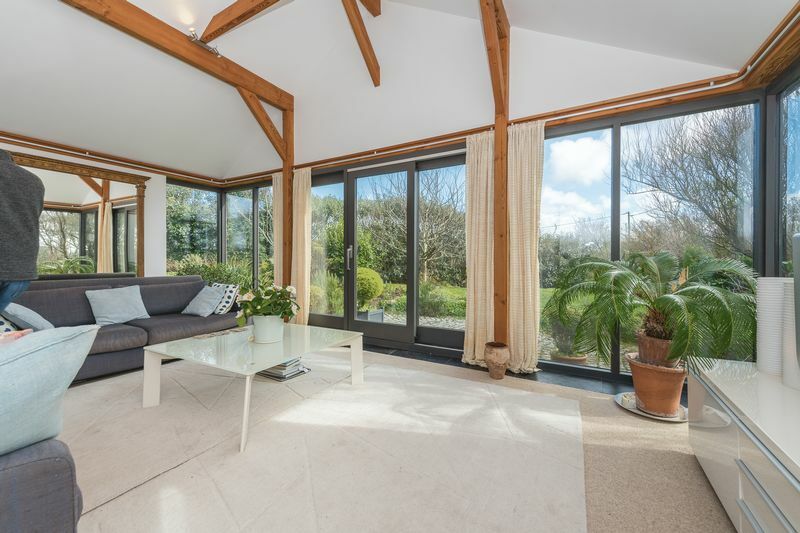 A fantastic light and bright room with tall double glazed glass triple aspect panels and sliding doors opening to a traditional style sun terrace, a vaulted double height ceiling with exposed A-frames, underfloor heating and television points at each end. 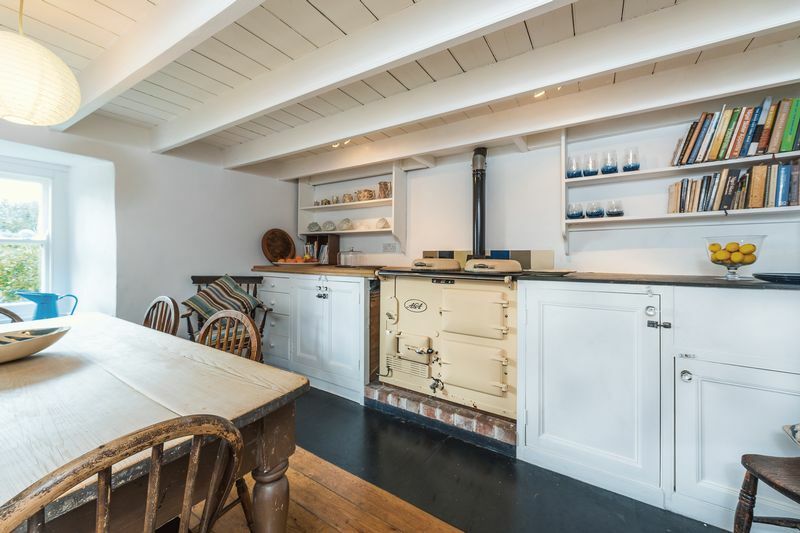 A multi-fuel stove with antique beaten copper surround, exposed wooden floor, beamed ceiling, sash window with deep sill overlooking the garden. Radiator. 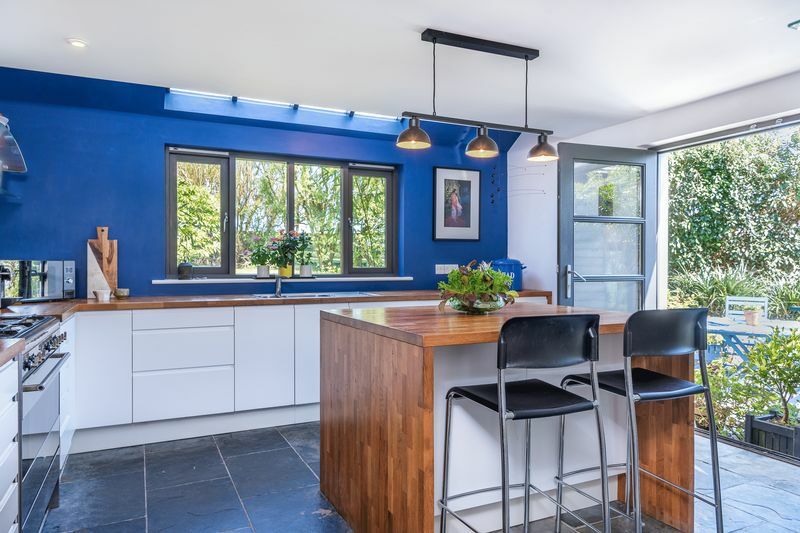 A range of contemporary glass and white base units with solid oak worktops over. Inset one a half bowl sink. 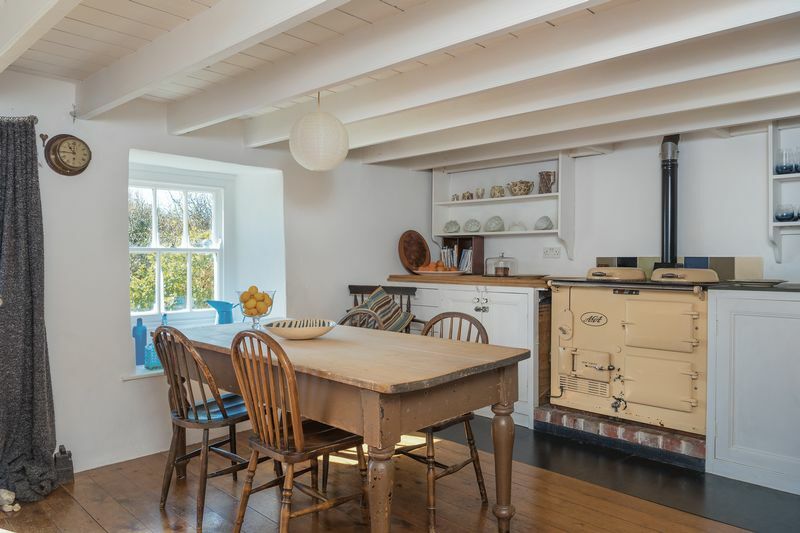 Stainless steel 'Smeg' range style cooker with five ring gas burners, extractor over. Integrated dishwasher, space for 'American' style fridge/freezer. Island breakfast bar/preparation unit with cupboards below and power point with oak worktops over. Slate flooring. 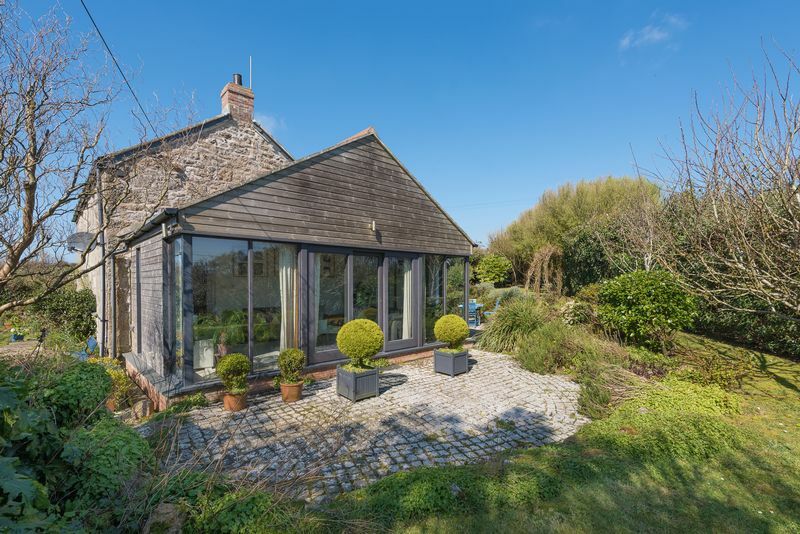 Double glazed window overlooking the rear garden. Double glazed roof lights. Double glazed doors opening on to the Mediterranean style dining terrace. 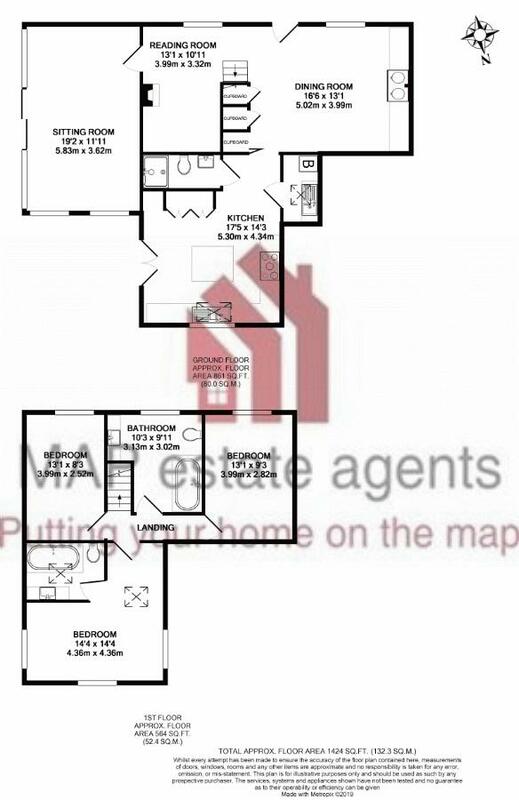 Two tall floor to ceiling wall units with glass shelves to one side, underfloor heating. Steel base unit with an inset sink. Space for washing machine. Double glazed 'Velux' window. Combination boiler. Slate flooring. Underfloor heating. A contemporary slate tiled shower enclosure with 'American' style mains power shower, WC, pedestal wash hand basin, slate flooring and underfloor heating. 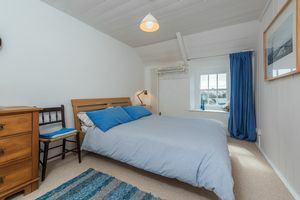 A lovely and light triple aspect room with double glazed windows enjoying views of Chapel Carn Brea and towards Sancreed. Period style radiator and handcrafted solid oak topped bedside unit with display shelves. Two 'Velux' windows. 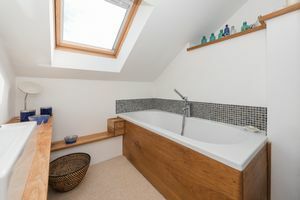 Handcrafted oak cabinet with ceramic sink and mono bloc tap, oak panelled bath with mixer shower and lustre tiled surround, heated towel rail and double glazed 'Velux' window. Extractor fan. Sash window to the front overlooking the garden. 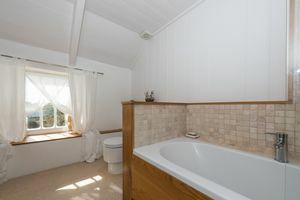 Period style radiator, wooden panelling and part vaulted ceiling. Overlooking garden with rural views beyond. Sash window overlooking the garden. Period style radiator, wooden panelling, part vaulted ceiling. 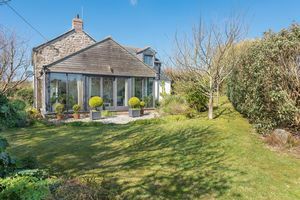 Overlooking garden with rural views beyond. 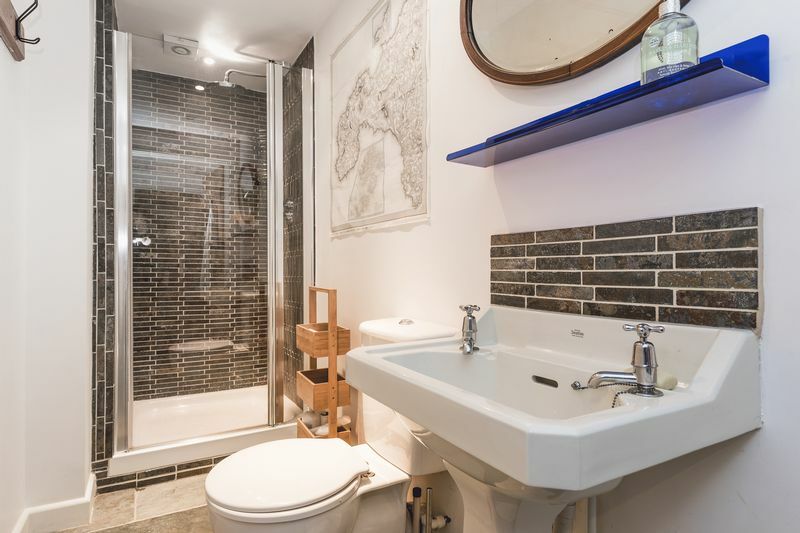 Handcrafted solid oak cabinets and worktop with ceramic sink, oak panelled bath with mains shower over, glazed shower screen with hewn marble tile surround and a low level contemporary toilet. 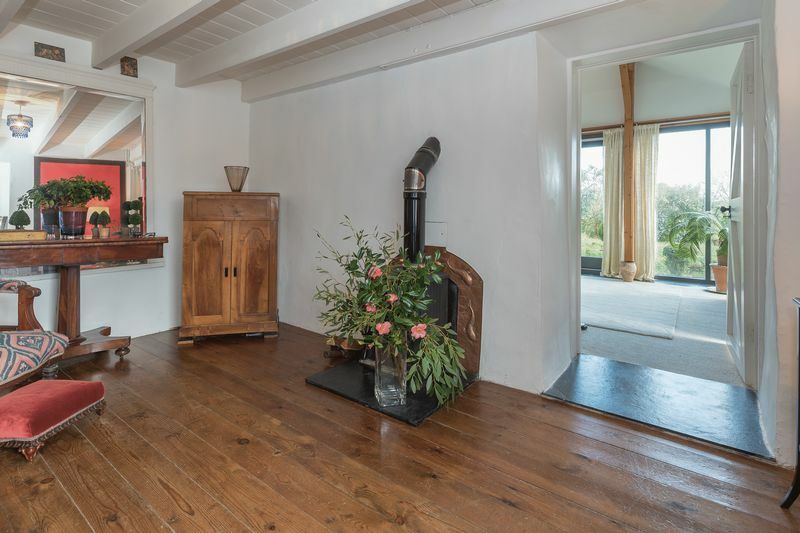 The walls are part wooden panelling and the central sash window has a large oak window seat. Access to loft. 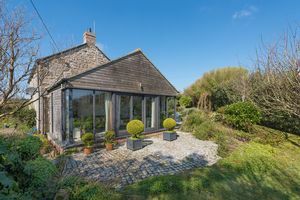 The front garden is mainly laid to lawn with Cornish stone wall bordering, here there is a wooden summerhouse with a glass lookout above and a variety of small trees and plants and a path leading to the front door. 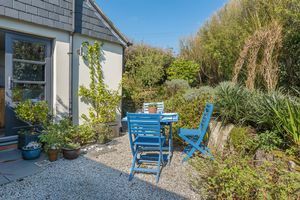 The side garden is very pretty with a high degree of privacy with parts laid to lawn and with a variety of established fruit trees and shrubs bordering. 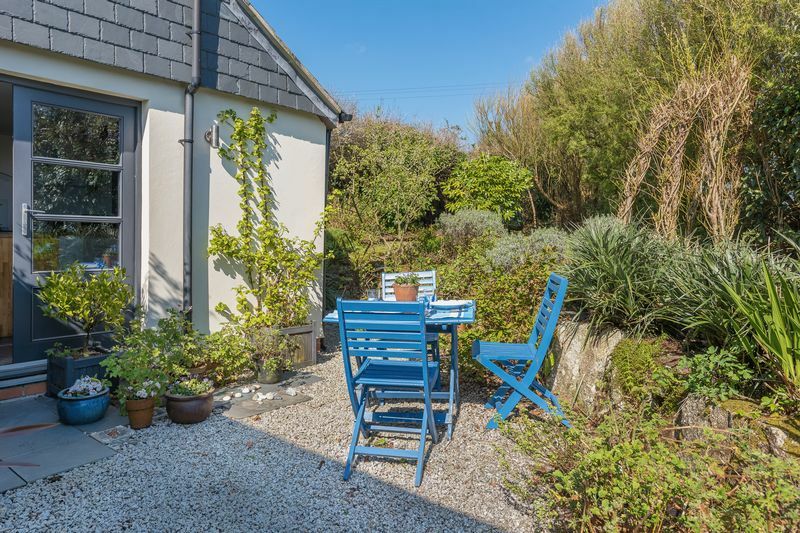 There is a beautiful traditional granite cobble stone terrace which is accessed through the lounge. 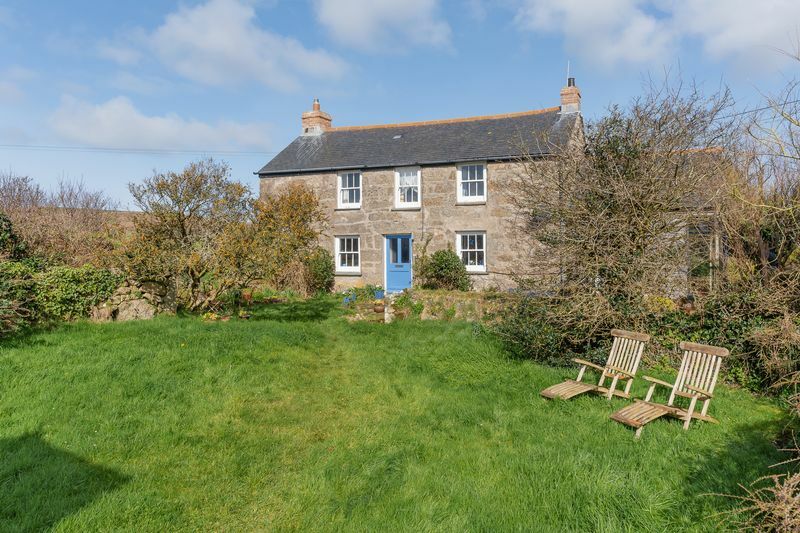 The rear garden is laid to lawn with high hedgerow bordering giving a good degree of privacy. 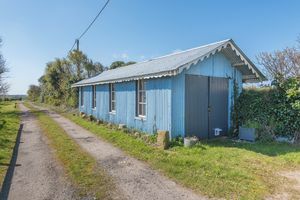 A gravel path threads around the rear of the property giving access to the Mediterranean garden and dining/barbecue area which is also connected directly to the kitchen through the French windows. This terrace has outside lights and a power point. The detached studio has a 'Belfast' sink and tap with wooden worktop to either side, electric shower and WC, electric water heater and storage areas. From Penzance take the A30 towards Land's End. 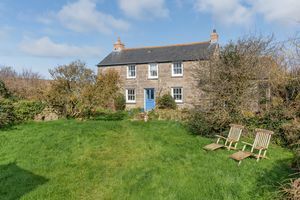 At Crows An Wra crossroads turn left, follow for approximately 400 yards and take the next right signposted Trevore Farm, follow for 50 yards and the property is on your left hand side.